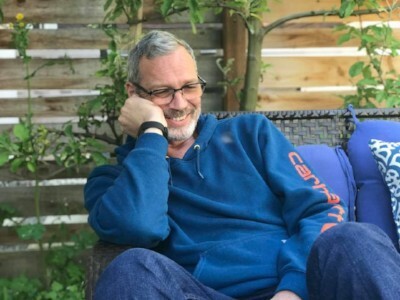 Robert Wheeler, age 51, died peacefully in his home on November 5 after an 11-month fight with pancreatic cancer. Robert was born on August 13, 1967 in Santa Rosa, California but spent his childhood in Washington in the foothills of Mount Rainier. After high school, Robert joined the Air Force and was stationed in Belgium. When he returned, he moved to Seattle and worked as a chef in various restaurants before joining the burgeoning technology boom at Microsoft. Robert spent 11 years in Australia, first in Canberra then Sydney, working in technology and consulting. He returned to Seattle in 2010 to be closer to his family. He joined a technology consulting firm in Seattle and met his wife while on his first project. Robert loved scuba diving, animals, travel, art, and spending time with the people he loved. He had an unconquerable spirit combined with an irreverent and goofy sense of humor. Robert is survived by his wife, Jennifer; his daughter, Ginni; his mother, Kate; his brothers, Rich, David and Brad; his sister, Beth; and countless friends on multiple continents who will cherish him in their memories for as long as they live. Family, friends, and loved ones are invited to celebrate Robert's life on Sunday December 2 from 2-4 PM at the Abmeyer + Wood Fine Art gallery (1210 2nd Avenue, Seattle WA 98101). In his true Leo fashion, Robert wished to be inundated with flowers. I'm sorry. I'm sorry I wasn't there when I should have been. And there is no word that I can say that will ever make up for my stupidity . I love you. And you'll always be my dad. And I should have told you so much sooner. Robbie—there is a hole in this world where you once were. It will never be filled. For the rest of my life I will cherish my memories of you, the love we shared, and the wonderful years we spent together—short though they were. You are the love of my life and I am better for having known you and your love.